The Door County Maritime Museum is pleased to work with group tours (15 or more visitors). We are conveniently located in the heart of historic Sturgeon Bay, and provide ample free parking. We have a variety of quality tours available. We’re also happy to work with family reunions and other large groups. Enjoy a 90-minute docent-guided tour through our 20,000-square foot Museum. Explore the rich maritime history. 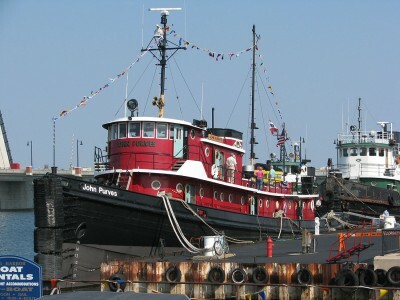 Add the tug John Purves to your Sturgeon Bay tour package. See the winch room. Explore the engine room and the galley. Tour the cabins. View the waterfront from the pilot house. Authentic and glorious in her details, this vintage 1919 tug has been refinished and restored through a five-year, all-volunteer project. Many of those same volunteers serve as docents on the guided tours of the vessel. Located adjacent to the museum on the Sturgeon Bay waterfront. Please allow at least two hours for the combination museum-tug tour. Cana Island Lighthouse. 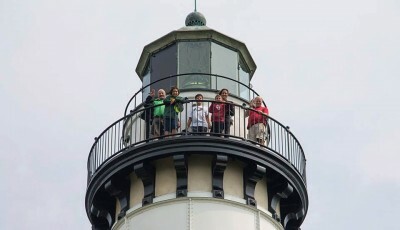 Thanks to painters and photographers, the Cana Island Lighthouse is one of Door County’s most recognizable land- marks. Built in 1869, the lighthouse remains an active navigational aid. Listen to the sound of the waves. Hear the call of the seagulls. Climb the steps of this 140-year-old lighthouse. Experience unrivaled splendor and the thrill of the view. The keepers’ house, the oil house, and the tower are open to the public seven days a week from May through October. Parking restrictions apply. No handicap accessibility; access via walking across a stone causeway. Docent overview available. Call for more details. Death’s Door Maritime Museum Tour. Located at 12724 Wisconsin Bay Road in Gills Rock, the Museum opened in 1975. Recently remodeled, the Gills Rock facility features exhibits on shipwrecks, lifesaving techniques and equipment, antique outboard motors, ice fishing, navigation and Great Lakes piracy. Enjoy the smallest details of our many ship models and our largest exhibit – the fishing tug Hope. The Hope was built in 1930 by Sturgeon Bay Boat Works (currently Palmer Johnson); she is now housed inside our Museum walls. The Maritime Museum welcomes school groups. Contact the Museum for details. Payment is due upon arrival. Please make checks payable to the “DCMM.” Visa, MasterCard, and cash are also accepted.